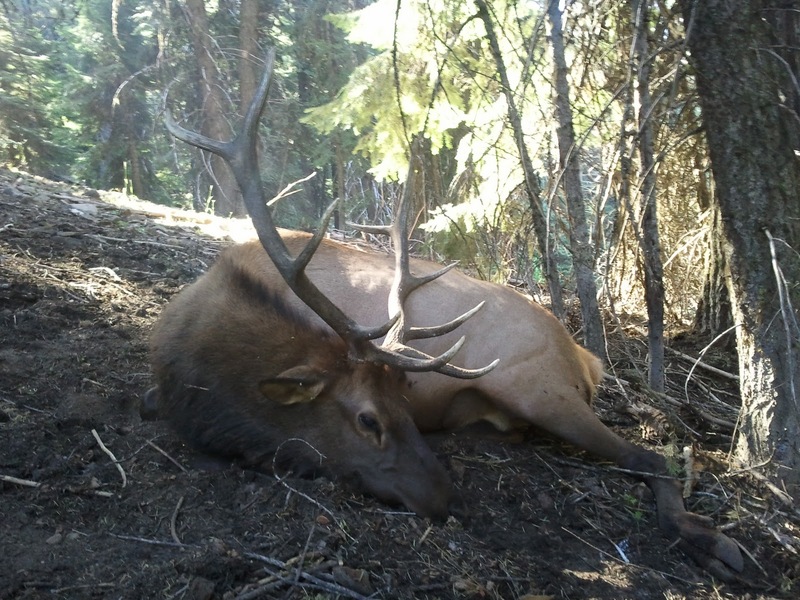 The switch had been flipped…opening day of Oregon’s archery Elk season had been epic. The cows were mewing, the bulls were bugling, dad tagged out on a great 5x5 bull, I passed up a 4x4 bull. Week two of the season was off to a slow start. The rut had not yet consumed the bull Elk and once public land hunting pressure had set in, the bulls had figured out that they were being targeted. With more hunters in the area than I have seen in years past it was no wonder that the bulls quit bugling and coming in to cow calls. With the bulls not cooperating, and unseasonably hot and dry conditions, I decided to sit in a tree stand over a wallow. The wallow is located in an area where I had patterned several large bulls moving through over the summer and was actively being used. This tactic worked perfectly as a young 3x4 bull came in to the wallow and stood broadside at 50 yards. Unfortunately, the big mature bull that I was looking for did not come to the wallow. While sitting the wallow with only young bulls visiting, I had a big mature bull using a game trail down the ridge so I decided to move my stand with the hopes of intercepting this big bull on the move. I just couldn’t manage to be in the right place at the right time. While I was out of the wallow stand on the 3rd - 5th of September, two shooter bulls came to the wallow on two of the three days. The bull that had been using the game trail up and vanished on me. Sometimes a girl just can’t catch a break. Taking some time to get out of the stand, dad and I stalked within 70 yards of two young branch bulls. There was no need to close the distance on them for a shot as I was still holding out for that larger more mature bull. Warm weather conditions made many of the Elk nocturnal. On the 10th of September, dad and I headed back to town and off the mountain as we both had to return to work until the 17th. On our way out, we just missed this bull but my trail camera did not. This guy was right above us and silent. Later in the season I had an exciting hunt featuring this monster bull, read my next blog to read the story and watch the video. While we were off the mountain the following week, check out the photos and videos below of what we missed. This nice bull was 50 yards from my wallow stand. During the course of the week that dad and I were off the mountain and working, we did not have activity on my trail cameras. 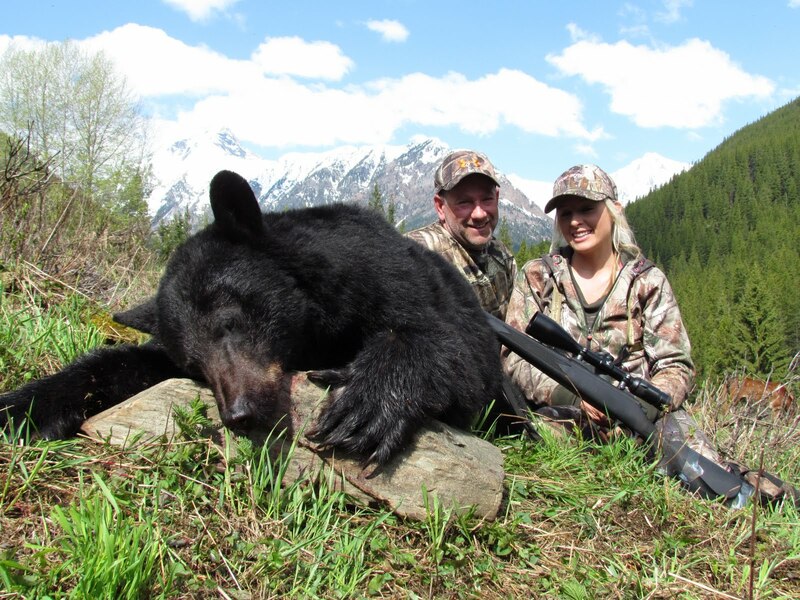 It was my understanding that there was quite a bit of hunting pressure from out of area hunters. The additional pressure had a big impact on their typical behavior and habits. The first few months of my year was kicked off by traveling all around the country to various industry trade shows with Under Armour. After a few long months on the road, I am more than ready to get back into the woods to do some hunting. This year, I was fortunate enough to get invited by my good friend Chuck Griffin to go hunting with him in Kansas for Rio Grande turkeys. The Old Stafford Train Station. Venturing to south central Kansas took me back in time and to a place that felt like down home America, right down to the delicious homemade pies at the historic Curtis Café. Nestled between the Quivira National Wildlife Refuge and the quaint town of Stafford, you will find a large diversity in habitat from salt marshes, woodlands, water management areas and land management areas that the Rio Grande turkey flourishes in year round. I had two turkey tags and high expectations for this hunt, but Kansas decided to live up to her windy reputation on opening morning of turkey season with robust winds that blew steadily at 20-30 mph. My hopes of quickly filling both of my tags were quickly diminishing due to poor current and predicted weather conditions for the week ahead. Opening morning, we set the decoys up on a known travel corridor between a wheat field and woodland roosting area with the hopes of calling in a gobbler after he hit the ground. I began an aggressive hen yelp without getting a response or hearing a gobble. Due to the conditions, the sound from my call wasn’t carrying out the way I would ideally like, with that in mind we decided to put our optics to use and try our luck with good old spotting and stalking. We quickly found a group of turkeys flocked together pecking around in the nearby wheat field. For fear of being spotted by the flock I chose not to set up decoys and instead set up immediately on the field’s edge under the cover of the woodlands. One young jake was tempted to come in to the sounds of my putts, purrs and yelps, but the hens that he was following quickly changed his mind when they fed off in the opposite direction. With the morning fading away and the weather not cooperating, we decided to back out of the area. Later that afternoon, the temperatures climbed to 75 degrees and the wind faded to a soft breeze. We set out our decoys just down from where we had spotted the large flock earlier that morning in hopes that they would once again return to feed before heading to their roosting area. The ground I was sitting on was transformed into a sea of movement before my eyes. What I had not anticipated was the hundreds of ticks that had also decided to get out and enjoy the warm change in the weather. The ticks were crawling everywhere and I thanked god for Under Armour base layer that is tick proof and kept me safe from literally being devoured by the small creatures. Despite the infestation, I sat tight and let out a series of soft putts, purrs and yelps, a single hen came in with an eager tom on her tail. The hen literally walked 5 feet in front of my friend and fellow hunter whom we will call “Bill” in order to protect his identity. Bill had taken the gift of warm weather and used it for a nap instead of an opportunity to hunt. Set up and patiently waiting. Watching from 40 yards away, I was shocked that Bill could hold so completely still with the invasion of ticks and all of this action unfolding directly in front of him. The huge tom was staring at him when he let out a series of snores that spooked the keen hen causing her to take off with the tom in toe. My only regret at this set up was not being able to capture Bill with the hen and huge tom only 5 feet away from him while he slept. To this day, I am not sure if Bill really believes what unfolded that afternoon. Thanks to Hartz dog flea and tick shampoo, I was able to get a good night’s sleep and wake up rested for the following mornings hunt. Under the cover of darkness, we set up the decoys; the toms were gobbling from the roost tree before the sun had even crested the horizon. With the weather cooperating and the gobblers vocal, I was sure that our luck was about to change and had high hopes of calling in a nice tom. When the birds hit the ground and the sound of the gobbles grew close, two nice toms quickly approached on the tail of a hen. Unfortunately for me, the trio did not cooperate and break out into the field where my decoys were set up, but instead chose to strut and display behind me in the cover of the woods leaving me no shot opportunities and no way of moving without being detected. We spent the rest of the day trying to call in a fervent tom without luck. The gobblers that we had encountered were not willing to abandon the hens that they were flocked with. We didn’t even find any enthusiastic young jakes that were willing to strut around for us. The next day, Kansas had decided to throw in a severe storm with winds gusting at 60 mph and pouring down rain. We decided to take the day off and drove to the small town of Great Bend Kansas in order to prepare to hunt in a new location when the weather eventually broke. The following morning presented clear skies and temperatures dipping down to 34 degrees. It was cold but the toms were gobbling in the roosting trees from multiple directions. Once again under the cover of darkness, we snuck into position and set up on the edge of a new food plot that was near the roosting area. With the decoys in place only 20 yards in front of me I visualized success in finally being able to take that long awaited shot. The birds were just as anxious as I was to get moving after being relieved of the heavy storm that had ripped through the day before. I called for just over an hour letting out a couple series of soft yelps and purrs when an aggressive gobbler responded quickly coming in out of my north. Moments later I had several gobblers also respond and start coming in out of my south. I was in the epicenter of eager gobbling toms. As quickly as the weather had changed, thankfully, so had my luck. A flock consisting of a jake and three mature toms emerged into the food plot out of the south and ran straight to my decoys. Without hesitation, I took aim and fired on the tom of my choice. After three days of hunting, I was finally able to fill one of my turkey tags with a nice mature gobbler. Having to fly out the next afternoon, I knew I was growing short on time to fill my second tag, but I wasn’t going home without trying for another tom. The evenings hunt was picture perfect with warm weather and windless skies. I had two hens come in behind me and peck around a pond; strangely enough they were without a gobbler. I left the field that night being thankful for the beautiful day and looking forward to one more morning to try and fill my second tag. The morning gobbles were erupting nonstop out of the sand hills at first light. Eagerly, I slipped in silently on the flock just as I would on a screaming bull elk. I set up just out of sight and called sweetly in an attempt to lure the tom away from his hens. Just like a big bull elk, he wasn’t budging, so I stayed in position for awhile in hopes that a younger tom would come into me like an eager sate light bull during the rut. After growing inpatient and short on time, I attempted to creep over the sand hills and get within range of the flock. There were two huge toms, several hens and a couple of jakes in the flock, a lot of eyes in open country that made it impossible to be stealthy enough for successful stalk. Getting within 70 yards of the giant toms made my trigger finger itch but unfortunately today was not my day for scratching it. As time ran out, I headed to the airport thankful for my time in Kansas and the reminder that with each dawn lies a new beginning. On this trip I was humbly reminded that within but a single moments time your success in the field can change but you must always remain patient, persistent and thankful of the extraordinary gift of the great outdoors. Thanks for the great gear Under Armour, Swarovski Optik, Bugling Bull Game Calls & Eberlestock.